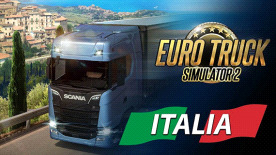 This new DLC map expands Euro Truck Simulator 2 with the beautiful country of Italy. Enjoy the diverse regions of this historic-rich country with traditional architecture, modern industry and diverse natural environments. Wend your way through the Apennines where tunnels and bridges alternate with scenic vistas and curvy highways. Descend from the height of mountain passes to the shores of the seas and travel past manicured farmlands in a land that is unmistakably the Italian peninsula. There is a high concentration of cities in this new map, both new ones – nineteen of them and updated existing ones many of which feature local industries.